Cinematic News: The Producers Association is in an absolutely inactive position. If the situation persists like this, the filmmakers will soon be destroyed, "says producer Vijay Sethupathi. There is a smoke in the midst of Vishal and Vijay Sethupathi from the day that the film was trying to put a stroke on the film during '96 film release. In this case, his 'Siddakadhi' release on December 21 has got a lot of trouble with the availability of theaters. Actor Vijay Sethupathi is in deep anger because Vishal has been forced to help in this case. In this situation, Vijay Sethupathi participated in actor Cheran's film festival in Chennai. A journalist questioned the source of the news that she was delayed to release the film. Wijesedipathy, who was so angry, went to the fight to get rid of the microscopes and question the problem. 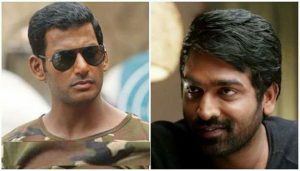 Actor Vishal has been indirectly criticized by the fact that the producer's association has come up with a lot of problems and a person can not solve it.